1. 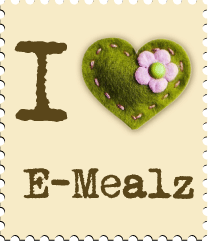 I'm a packrat, I'm not a good cook, but I love to try , I LOVE to knit. 2. Why do I have so much yarn and not not enough time to knit it all? 3. How does this computer work, anyway? 4. 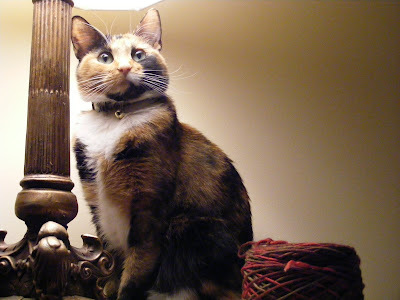 Every morning, I put a dish of stinky can cat food on my Dryer for Bella to eat so the dog won't get it. 5. I consider myself lucky because I have family that loves me, an ABUNDANCE of friends, a home to live in, food to eat, and a nice yarn stash to knit from. 6. One day we’ll see man land on mars. 7. And as for the weekend, tonight I'm looking forward to knitting, tomorrow my plans include most likely helping hubby with work and Sunday, I want to stay home in my P.J. 's and knit, but will be going to a family birthday party, which is always a good thing!! Everyone knows Birthday Cake has ZERO calories!! LOL!! 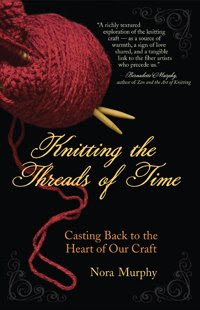 Like Elizabeth, I too received an invitation to review Knitting the Threads of Time: Casting Back to the Heart of Our Craft by Nora Murphy. 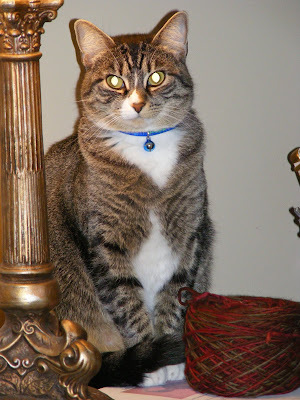 (And be sure to read Elizabeth's review as she is much more eloquent than I am)! When first thumbing through the book I thought it was going to be an easy, quick read, in a nutshell, the journey of someone knitting a sweater with little "epiphanies" added in along the way. I was wrong! This book incorporated an INCREDIBLE amount of history, along with so many personal observations.....very interesting....from the first documented date of knitting to present day!! Despite curiosity, there is no way I would have spent the amount of time involved to discover all the facts this book brought to light for me! A very enlightening history lesson knit together with a story not just about the act of knitting a sweater, but all the lessons learned both with the knitting and the personal reflections of how it correlates to life!! The local history of Nora Murphys hometown (St. Paul, Minnesota), was also VERY interesting to me as well!! 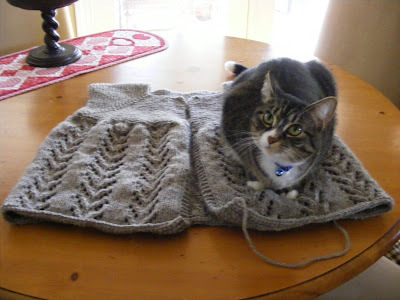 I'm also with Elizabeth in that I wish the author had included a picture of the finished sweater. And It Burns, Burns, Burns.......The Ring Of Fire.....The Ring Of Fire.. I love this pattern!! 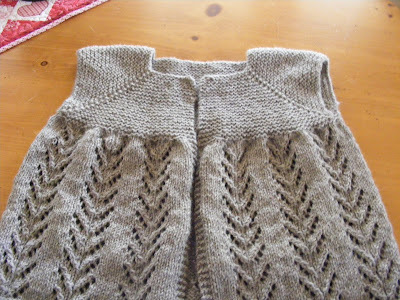 An easy, quick knit that fits fantastic!! I think this is my third pair!! Last but not least, Juliet has left the building.....sent on her merry way to a friend who has been instructed to pass it along once she has HER Juliet knit!! I found this pattern and decided since I wanted to knit a sweater, but I'm not a sweater wearing gal, this pattern would be PERFECT for me. This is what Juliet is SUPPOSED to look like!! In particular, notice how the edges of the sweater do NOT meet or touch, there is SUPPOSED to be a rather sizeable gap in fact!! Unfortunately, MY Juliet is too large (despite my initial thoughts it would be too small). When I initially laid it out to dry/block it was HUGE....and I managed to "scrunch" it down as much as the pic shows....and it doesn't look so huge in the picture. BUT....when I have it own, I can wrap it over like a double breasted coat!!!! According to the pattern and my bust size I should have knit a large. I wasn't ever able to achieve the size 14 stitch gauge, but got 15, so I went down a size and knit according to the medium rather than large. 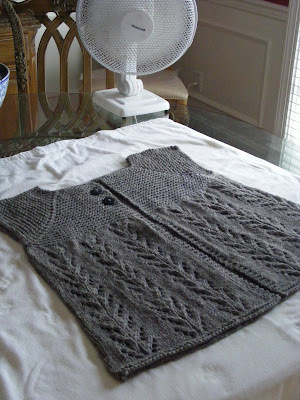 I do like this sweater and I have enough ecowool to knit another, just wonder if the yarn had anything to do with it. Once I pulled it from the water it had "bloomed" to seemingly ginormous proportions, or maybe I'm just used to socks!! Ahhhh.......it's fun to learn from your mistakes!!! (insert sarcasm)!! LOL!! 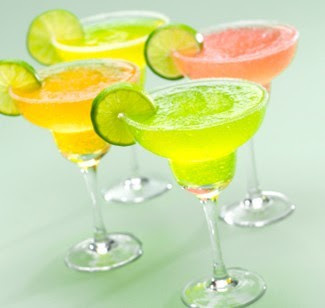 Today is NATIONAL MARGARITA DAY!! Certified by the Food Channel!!! That's good enough for me!!! Do you SEE what it is DOING???? 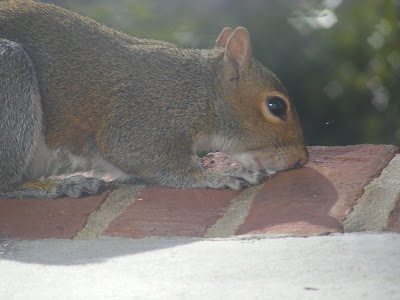 What IS IT with these freaky squirrels LICKING the mortar!!?!! Over the past years, they have licked the very mortar away from the edges of the bricks!!! 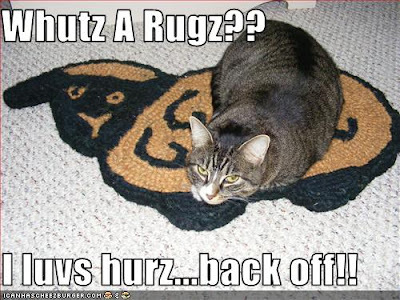 Sadly, the cats are even tired of it....barely worthy of a second glance!! Yeah....not so cute anymore are they?? 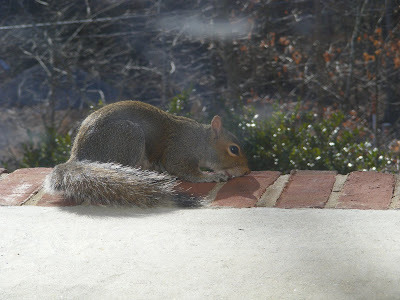 And to THINK......I used to think squirrels were cute little critters!!! 1. Give me a Margarita and I'll drink it! 2. Whenever I see a yarn store my heart races. 3. I wish we would never lose our loved ones. 4. Homemade Banana Pudding was the last thing I ate that was utterly delicious. 5. To live in this world is to make some happy and to tick some off! LOL!! 6. 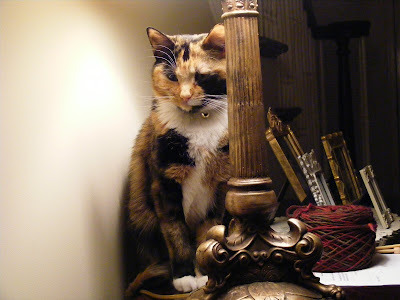 Other than this one, Jessi's is the last blog I commented on. 7. And as for the weekend, tonight I'm looking forward to going to a Mardi Gras Party, tomorrow my plans include, straightening the house a bit, bake a bit and Sunday, I want to KNIT!!! 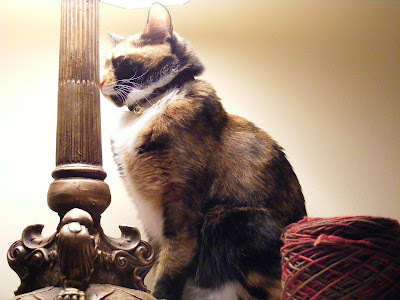 I shall sit upon my throne, underneath the lamp, and stare down upon my LOWLY subjects!!!! Ahhhh....... tis good to be the Queen!! Anything YOU can do I can do BETTE R!! No you can't, no you can't, no you CAN'T!!! 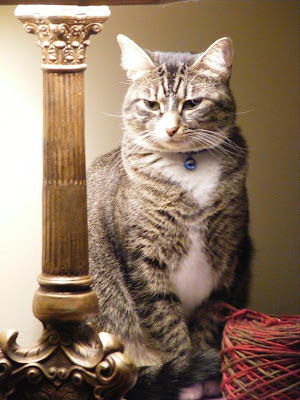 Hee, Hee.....I will not even LOOK at you now, you are dismissed.....not even worthy of a glance!! Ahhhh........Juliet is OFF the needles!!! I have got to decide the number of buttons and make the button loops before I block....but Ohhhhh.....I am so darn tickled!!!! Knit with Cascade Ecowool.....because that was all I had in my stash but I will most DEFINITELY be knitting this again....once I'm off this darn yarn diet!! LOL!! BUT....more important, it is Heidi Approved!!! LOL!!! We are pretty low keyed around here when it comes to "occasions".....like Valentine's Day, Anniversaries, Birthdays. 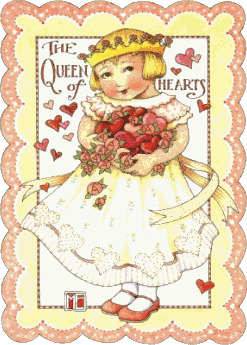 Valentine's day generally consists of cards exchanged and a special dinner prepared. In anticipation of a good meal for dinner, we had a light lunch.....ahhhh....but love was in the air even then. 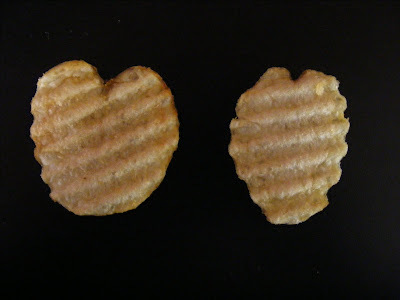 Look what I pulled from a bag of chips my DH and I were sharing!!!! I'm trying to get back to regular blogging and always enjoy Jessi's Friday Fill In posts so much I decided to be a copy cat!! 1. It seems like I'm NEVER organized. 2. CLEAN UP when you're done, please? 3. If I thought you would Uh Huh...I'd yes indeedy!! 4. Lucky is what I think of most when I think of you. 5. To me, Valentine's Day means love and chocolate and not necessarily in that order!! 7. And as for the weekend, tonight I'm looking forward to working on Juliet.....tomorrow my plans include contemplating picking up the bits of tree limbs that blew down during a recent storm (note I said CONTEMPLATING, not actually committing).....cooking a special Valentine's dinner for my DH and Sunday, I want to H.O.P.E.F.U.L.L.Y. finish Juliet!! Heidi has a NEW love in her life!! Isn't that JUST like a cat??? Loves you one minute....then it's off to someone new the next!! Not REALLY miles of knitting.....but felt like it!! 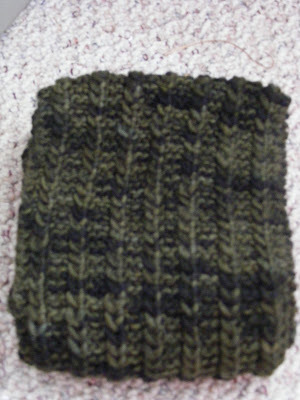 Malabrigo Worsted, Stonechat, 2 X 2 rib. Knit by request for my nephew that moved from Ft. Lauderdale to Richmond Virginia......yes.....he's cold!!! 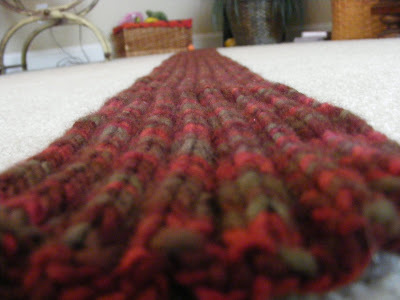 Also knit, the One Row Scarf. This yarn is very, very similar to the Malabrigo. These scarves will be on their way to Virginia today!! 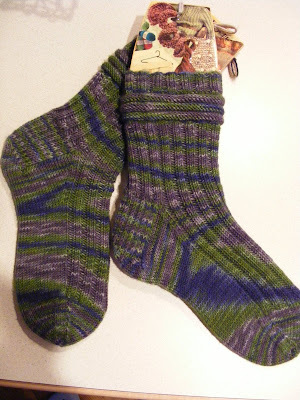 Now I must finish gift socks then it will be time to visit Juliet again!! !